A tall man at 6″6′, Niels Jensen doesn’t fit in most cars, his legs are too long. This hasn’t stopped him from his love of cars, or from racing in the Bahamas Speed Week Revival for the second year in a row (the revival of speed week began two years ago). The original Bahamas Speed week ran from 1954 and 1966 and was a high octane competition between Americans and Europeans (read official history). Nowadays, the races consist of cars (both vintage and super-cars) shipped in from around the world. Niels Jensen personally rebuilt a classic 1968 Mustang while living in Houston, Texas. Mr. Jensen is an executive with Clipper Group. 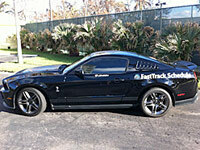 When he was transferred to their Nassau office, he sold his Mustang and missed it greatly. There are not a lot of long roads in the Bahamas, so he decided that another Mustang built to drag race might be the ticket. He found one that was in rough shape, but had a newer motor geared for drag racing. He rebuilt that Mustang from the floor boards up. But one issue that remained with this car was its lack of air conditioning. Air conditioning in the Bahamas is a must, so he sold the car and purchased a modern classic – a Ford Shelby GT500. With this car, he got 550 horsepower, the air conditioning that he sought, and a lot more.